There are many stylish ways to keep the sun out of your eyes when you're out on the green since golf hats come in so many styles and colors. Why Wear Special Hats for Golfing? Flat caps: These have several names, including ivy hats, scally hats, and contour hats. They have a similar look of a beret, but there is typically a bit more structure, a lowered back section, and a sweat band. One of the most popular looks for this style of hat is bright plaid, though it comes in solids and more understated patterns. Visors: These don't offer much coverage, but they can shield the eyes from the sun. If that's all you need, a visor may be the best bet for you, especially if you hate feeling as if your head is sweating under a cap or other hat style. Visors simply wrap around the circumference of the head and jut out to block the sun in front. Fedoras, outback hats, and safari hats: These are all fairly similar in style. There's a brim that goes all the way around the hat. On the fedora, the back of the brim is curled up; on the outback and safari hats, the brim is straight. They are typically soft hats that are creased from front to back and pushed in at the crown area. Ball caps: Ball caps are everywhere, from the baseball field to the golf course. They're a great casual hat choice for anytime. If you don't want a large selection of hats, choosing a ball cap to do the job on the golf course will ensure that you have the most versatile option. Bucket hats: These hats also have brims that go all around the circumference to offer shade and a bit of UV protection, but the brim is downturned rather than straight (like the safari) or upturned in the back (like the fedora). Hats in the Belfry, where they make an interesting observation: golf hats tend to either do a fantastic job of keeping the sun off your face and neck or they make you look like a great golfer. It's rare to find one that undeniably does both. That said, Hats in the Belfry gives you plenty of options from which to choose your happy medium. Amazon.com comes to the rescue, as usual, when it comes to golf hats for summertime games. There are all types to choose from, from flat hats in plaid to caps that look like they could belong anywhere, including the golf course. Village Hat Shop has everything from fedoras to berets. You can shop by brand or style. 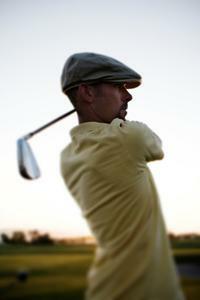 Choosing the right summer golf hat will allow you to stay comfortable during your golf games. Look for the qualities that are most important to you, such as increased UV protection or a quirky, colorful style. In the summer, you'll want to make sure that no matter what hat you choose, it has a sweat band and lightweight material that won't make you feel even warmer out in the sun.